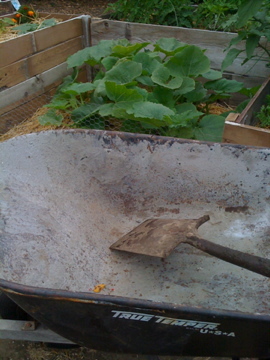 The following post was made possible by my new (used) wheelbarrow. My mom, incredible bargain shopper that she is, bought it for $5 at Goodwill. Normal retail value: about $80. She’s a genius. It was a canalouplantation weekend. I think I’m going to write a song using that word, which I just totally made up by combining cantaloupe and transplantation. But you already knew that, didn’t you? Because you’re one of our readers: smart, funny, and beautiful. The melons (I’m assuming cantaloupes, but they’re all volunteers, so they could be pumpkins for all I know) were taking over the mound I had assigned to them. I had to regulate. 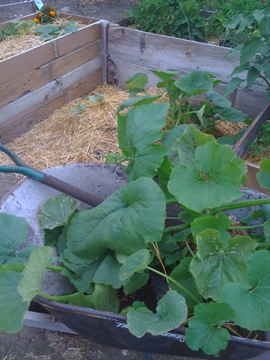 Last week I pulled a bunch of the babies and gave them away to a group of organic gardeners who meet at ECOSLO. This week I had to move several of the bigger to a place where they have room to roam. A place without fences or walls. A place where they could be free. Otherwise known as the south side of the house. 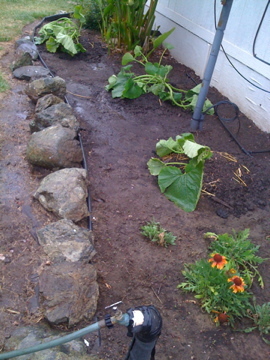 I made three mounds of the (not nearly as rich) dirt, added some Black Forest compost, and soaked them with Kaia’s help. Which means the mud ended up everywhere instead of just on my hands. My exposed skin is now baby soft. Today, they’re looking a bit…blah. Fingers crossed that they make it. In my opinion, one can never have enough [insert favorite melon here]. oh, i thought that’s where you got it from! i will totally be your editor. send can’t elope. hahaha… where the deeeer and the canteloup plaaaay!! can’t elope, dad’s got the car! You are a girl genius. I don’t even think about the whole “antelope/cantaloupe” thing. You should be my editor.